Social media marketing has been one of the most important topics over the last few years. Every marketer knows that every company must have accounts on the most important social media networks in order to attract new clients and to keep contact with their existing clients. Social media networks like Facebook, Twitter, Google+, Instagram, LinkedIn or Pinterest have different tactics and tips in order to make your presence on this social networks useful for your brand and for your clients and potential clients as well. 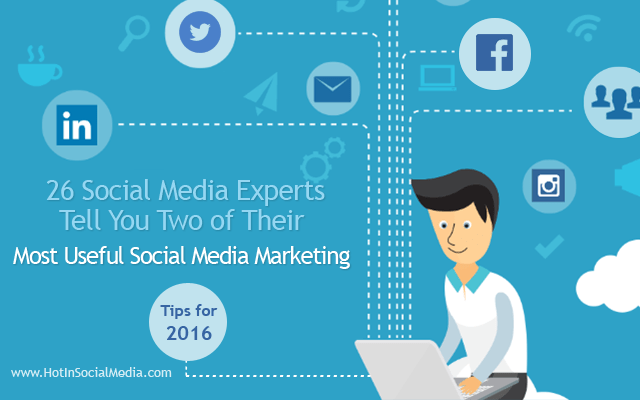 I asked some of the most well-known social media experts to tell our Hot in Social Media audience what their best two social media marketing tips for 2016 are. You can read below all of these social media marketing tips for 2016 from these top social media experts that have years of experience with different social media networks. Donna helps businesses, brands and entrepreneurs get more traffic, shares, and sales with visual social media and content strategy. Winner of Best Business Blog in Australia (2014) and a Top 10 Social Media Blog 2015 (Social Media Examiner), Donna has been featured in Forbes and Entrepreneur and regularly writes for sites like Social Media Examiner. 1. Post Like a Fan, not a Marketer. On any platform, when you are looking for what you should be posting and what will resonate with your audience, look at your audience and see what they are posting, what they are sharing. People are not on social media (for the most part) to buy your stuff. They are on Facebook to hang out with friends and be entertained. They are on Instagram to share moments in life… whatever the platform, take a step back and look at what native content your fans are posting. Then stop posting like a marketer, and start posting like a fan. 2. Use Tools that help you Create Visual Content Quickly and Easily. We have access to so many great tools now that anyone can be creative, and quickly and easily create content that catches attention and drives traffic on any platform. I recommend starting with Canva and Relay on a desktop. On mobile, some great tools for iOS and Android are Over, Studio, Brandr, and Typorama. Mike is a Blogger and Author in St. Louis, and the Chief Marketing Officer at SiteSell. He has been working with websites and the Internet since the early ’90’s and is active on all of the major social networks. Mike teaches a holistic approach to content marketing that leverages blog content, social media, and SEO to drive traffic, generate leads, and convert those leads into sales. 1. My first tip is to make sure that you’re consistently present. You cannot tweet a few times today and then come back to Twitter weeks later and expect droves of people to have followed you. You have to work at social media day after day. 2. My second tip is to always remember that Social Media is about relationships. And that’s why it’s not something you can just ignore for a while. Never lose sight of the fact that everyone else on social media is a person, just like you, and they’re using social for their own personal motives. If you make your social profiles all about yourself, it’s unlikely that others will be interested. Instead, work on making sure that most of your posts and activity are there to help others. Highly regarded on the world speaker circuit, Lilach Bullock, co-founder of Comms Axis has graced Forbes and Number 10 Downing Street with her presence! Listed by Forbes as one of the top 20 women social media power influencers and likewise as one of the top social media power influencers, she is one of the most dynamic personalities in the social media market and was crowned the Social Influencer of Europe by Oracle. A recipient of a Global Women Champions Award (by the Global Connections for Women Foundation) for her outstanding contribution and leadership in business. 1. Measure everything you do. If you can’t measure it. Don’t do it! 2. Engage with your audience where they are, not where you want them to be or think they should be. Larry is the founder of Mobile Monkey and previously founded WordStream, the World’s leading provider of Facebook and Google advertising software for small and medium-sized businesses with over 10,000 customers worldwide. · Stop promoting junk social media updates. Only pay to promote your most engaging content. The top 1 or 2% of your stuff. You’ll get much larger ad impression volumes at much lower costs. 1. Pixel your audience – Most of your website visitors will not come back to your website and you won’t convert many of them at first attempt so you need to track your audience visitors so you can build up a retargeting list for ads. Even if you are not planning any ads at the moment start building your list for the future. 2. Learn more about the process of building sales from social media. This is entirely possible if you understand the process. Follow our PRISM funnel model to generate that income. 3. Don’t spread yourself too thin. There is a massive increase in the number of social platforms but a ‘be everywhere strategy’ is great in theory but it doesn’t work for a small business. Focus on the most important channels and when you’re generating effective business relationships and profit from those channels then consider the new ones. It’s important to dip your toe in with new channels so you understand what they are about but don’t lose your focus. Tim has been in sales for 27 years and recently worked on the roll-out of Social Selling at Oracle, across Western Europe and 2000 people. Tim has created a methodology for companies to implement Social Selling which is expected to give companies a 20% uplift in revenue as well as providing a competitive advantage. Answer: People need to stop thinking that Social Selling (and Social Media) as a Platform or a tool. Social is a strategy and culture, without that don’t expect the “needle to move”. Martin is the founder and community manager for Plus Your Life and Plus Your Business and has built one of the most well-known brands around all things Google for business, including Adwords, Search, Reviews and Google+. My tips for next year are to focus and to measure closely what is working in existing channels. Every year the market moves and you need to move with it. Another tip is the best I could give – social media is all about relationships, so look at who you can support, and lift higher. By having this view, you will help build a community of value over time. Sue B. is the #instagramexpert, founder of Insta-Results (the world’s first comprehensive online Instagram course) and Ready Set Gram. She’s a popular CreativeLive instructor, powerful speaker on prominent stages like SMMW15 and highly sought after business coach. She’s passionate about teaching entrepreneurs and marketing professionals how to easily leverage the power of Instagram to get tangible business results. As a serial entrepreneur, Sue B. has 30 years of business experience, including SueB.Do, Boxer Rebellion and Susan B. Zimmerman Enterprise. With her extensive knowledge in social media and 30+ years of business experience, it’s Sue B.’s mission to teach, mentor and empower others to be highly successful entrepreneurs. If you want to maximize your social media marketing tools, you need to use a customized bit.ly link (https://bitly.com) in your Instagram bio. This shortened link allows tracking click-throughs and leads, which will provide you with data to see how many clicks are leading back to your website. Instagram’s Explore Feature allows for a one-click trip to explore everything from post related to trending hashtags. Keep an eye on trending hashtags that are relevant to your business, you’ll want to use those as part of your hashtag hub. 1 – Content Creation Is The Ultimate Fan Advocacy: What it all boils down to is that in the new world of content marketing, the Content “IS” the Marketing. Sharing, conversation, and emotionally connected content will be the ads of the future. Instead of thinking in terms of “Convince and Convert,” start thinking in terms of “Converse and Convert.” Helpful content gives your customers reasons to stay engaged—not just react—and also increases brand advocacy. So start thinking like a publisher because the more relevant, helpful content you create, the better you can drive engagement. 2 – Make Engagement More Personal: People respond to people best in one-on-one, face-to-face situations—that’s just the way we are. So when you try to automate that process and remove the personal connection, immediately there’s a wall between you and your audience. People gravitate toward social communities to talk to each other, find out what’s going on, ask for recommendations for things or services we need or want, etc. So social engagement isn’t just about posting stuff; it’s about communicating with real people. 3 – Adding Value Back into Online Relationships: Make a conscious effort to re-evaluate the word friend as you currently think of it the next time you’re on social channels. Look at your own online self and ask, “Would I want to be my friend?” Are you doing what it takes to be a real friend, or have most of your online relationships gone on autopilot or faded into the crowd? Let’s make 2016 the year we “take back the word friend” and give it real meaning again. Adam is the founder of Blogging Wizard. Previously Operations Manager for a UK based marketing agency, Adam now helps others to become more successful online. 1) Help instead of going for the hard sell – We need sales but we can’t forget the importance of building relationships that matter. The average person will see countless advertisements on a given day, so it’s understandable if people are tired of being sold to. Help first, sell later and you’ll turn average customers into raving fans. 2) Don’t build your house on rented land – To gain traction on social networks, the most effective way is to focus our efforts on a single platform. But, what happens if that platform disappears or changes? All of that time, money and effort you put into it is gone. For example, when Facebook changed its algorithm, organic reach nose-dived and a lot of brands found themselves having to pay to reach the community they created. To avoid this, remember that social is just another channel that plugs into your marketing strategy and is mindful of becoming over-reliant on a single platform/network. Diversify your approach to social networking and any other traffic generation tactics you are using. Randy is an entrepreneur, marketer, author, and blogger on online marketing, SEO & social engagement topics. A 4x author, he’s also a stage IV Cancer Survivor who has been seen in: forbes.com, business2community.com, steamfeed.com, socialmediatoday.com, financialpost.com, spinsucks.com, the CTV News, and recently, he was featured nationally in the Financial Post Magazine: Entrepreneur/Innovator edition, the article titled: Keep Running. – Business people should treat social media management as a networking activity. Be polite, helpful and friendly. – Stop pitching. Really, stop it right now. A few years ago, a self-declared ‘thought leader’ suggested people send a welcome message to everyone who connects with them on LinkedIn, and in fact, he does so himself. I know because I connected with him and received a list of links (22 links in all) to his content, while not receiving a single hello or how are you (my finger is still wagging at him!) Write this down: canned messages in social don’t work. If you have one of these ready to post, delete it immediately and start having real conversations. Stephanie Frasco Clegg, VP Social Media Marketing, started helping businesses get results with social networks before Twitter even existed! Stephanie has worked directly with high profile clients like Oprah, Atlantic Records, Dashlane, The International Culinary Center, & many more. She specializes in helping business owners and marketers find massive ROI by developing targeted social campaigns focused on *engagement strategies* that work! Answer: Connect with the right people at the right time. If your audience is online at night, that’s when you will find the most engagement. Senior Community Manager for B Squared Media. Social media & blogging freelancer. Coffee lover. Contributes articles on a variety of social media and marketing sites including Curatti and TweakYourBiz.com. 1. The quality of the content you share with your social media audience (whether you create or curate it) is essential. With so much content out there, it’s becoming increasingly difficult to stand out. Consistently share the content that your audience finds helpful and entertaining and they will appreciate it. 2. Reply and respond as often as possible when people share your content – and always be kind (or, at the very least, neutral) in all your social media interactions. Never try to reason or argue with the “trolls” because you’ll never win. Natascha is the CEO of MarketingXLerator, a marketing consultancy with a focus on social media. She consults with small and large clients including SAP, Polycom, SLAP Company, LookingGlass and HR Strategies. Tip 1: Know your audience – in as much detail as possible. Tip 2: Prioritize ruthlessly. Start small and grow instead of trying to do it all. Think “Crossing the Chasm”. Andrew Hutchinson is an award-winning writer, blogger and social media consultant from Melbourne, Australia. Learn to use Facebook Graph Search. Facebook rolled out Graph Search a few years back, then de-emphasized it because it didn’t quite work as they’d have liked. But you can still use it, and you can still discover amazing insights using Facebook data – the biggest collection of personalized data points that’s ever been created. If you’re not sure how to use Graph Search, look it up, it’s worth taking the time to work out what’s possible. Use Hootsuite to Track Twitter Mentions. If you’re doing any kind of social media marketing, social media monitoring is also a must. Using HootSuite, you can search for mentions across a number of networks, but Twitter is by far the easiest to track and the best source of rich insights. You can search for mentions of your brand, mentions of your industry, hashtags – anything you can think of, and you can narrow those searches down to specific regions and areas, which really honest in your results. And once you’ve set up a stream in HootSuite, it’ll continue to automatically populate with new mentions. Keri is the Founder and CMO of Idea Girl Media, a Social Media Marketing Agency that works with business brands, public figures & non-profits to achieve social media success and positive online reputation. She is humbled to have received a 2013 Small Business Influencer Honorable Mention Award, and a commendation for Outstanding Attainment in Social Media from the Senate of the State of Ohio. Her insight has also been featured in Social Media Today, SteamFeed, Search Engine People, and AOL Small Business, as well as in Forbes, Business Insider, and other industry blogs. Non-fat lattes, travel & quick wit make Keri smile, and she is always enthused to meet new people! TIP 1: Schedule time to attend tweet chats and important Blab and Periscope broadcasts. These are excellent ways to stay engaged in your niche, and with potential collaborators and clients. Social networking with turbos! TIP 2: Quality over quantity. Rather than have a mediocre presence on many networks, choose 2, 3, or 4 that you can do well so that you can lead your niche. Julia helps her mission-driven clients find their audience online, using websites, email, blogs, and social media marketing strategies. 1) Know who you are talking to on social media. If you are posting without a plan, or without deep knowledge of your target audience, you will fail. Always know who you are posting to and what they are interested in, what inspires them, what floats their boat. Then give them more of that content. 2) Quality over quantity. Pick one or two social networks or digital marketing channels and do them very well, rather than spreading yourself too thin on multiple channels. This mantra also extends to the types of content that you post. Take the time to create great content for your social networks rather than throwing stuff up just to make sure you are hitting your daily quota. Better content marketing. It’s no surprise everyone is inundated with content and exhausted with the options…most of them not good. Create content that is more creative. Get smart about how to use influencers..and use them. Find new ways to amplify your content. Get better at it, overall. Paid amplification. I have a really good friend who thinks amplification is the next big thing. When you spend time amplifying a story for a journalist, what kinds of results do you see from them? Do you have a stronger relationship? I’m willing to bet you do. To get the kind of audiences you need—and break through the gross amount of bad content—we’ll have to throw some money against amplification, just like we do sponsor content. I help digital entrepreneurs find success online. In 2016 if you want to do big things in social you should focus on social ads. It’s the way they developed the system and if you want to drive quality targeted traffic and grow your social accounts etc much faster. You need to learn, run and test ads on your favorite social platforms! Find the balance between automation and humanization when managing your personal or business accounts social media accounts. Use the time saved from automation to engage with the community you’ve developed or are a part of. Recognize and develop relationships with your brand advocates online. Utilize user-generated content into your posting strategies to encourage brand mentions via social media. Reginald is a freelance consultant focusing on content marketing, search, and social media. Always thinking of Big Data and new marketing techniques. Answer: The first tip doesn’t be afraid of paid advertisements. With proper strategy, you can gain thousands of followers with a super tight budget (like under $50). Of course, I don’t mean Fiverr but more towards services from Facebook and Twitter ads. Secondly, find the right platform for your business. Not every platform works well for your business. Therefore, always perform tests to ensure that you are sharing the best content on platforms which provide you with the best ROI (return of investment). DARC: Digital native with Analytical chops, strong web Reach, and Content creation skills. Media marketing director by day, social media helper by night. 1. I probably mentioned this last year, but it’s still as relevant today. Don’t try to be everywhere online. Social media is a time-consuming endeavor. Find the “right” channels where your audience is on and spend time there. 2. Focus on ‘density’. What I mean by that is we get hung up on optimizing every little detail of a social media post that we lose sight of the goal. Best time to post, daily post frequency, optimal text length, etc. All that is a waste if you’re not providing value and meaningfulness. Be insightful/knowledgeable… not dull. Be genuine/honest… not insincere. Be amusing/funny… not boring. Marji J. Sherman is a globally known social media strategist that has been featured in Inc. Magazine, Jay Baer’s SocialPros podcast, The Growth Factor and numerous other podcasts and publications. She writes a successful blog (www.MarjiJSherman.com) where she relates real-life experiences to the ever-changing landscape of social media and has over 160K followers on Twitter (@MarjiJSherman) where she focuses on positive living and leveraging social media while still remaining authentic. 1. Be Authentic! : At the end of the day, do not get caught up in the trends. Find what works for your brand and tells your story in the most authentic way. Consumers will gravitate towards your genuineness and appreciate your transparency. 2. Be Where Your Fans Are: Put yourself in your fans’ shoes and find out what networks and messaging resonate most with them. You are on social for your fans, not for yourself. The sooner you understand that relationship, the sooner you will attract genuine fans that will want to buy your product/service. Stephanie Boyette Nelson is a Charlotte, NC-based marketing professional. Her experience runs the gamut – print ads, print newsletters, event coordination, e-mail newsletters, paid search, SEO – you name it! She currently specializes in social media marketing and SEO for small businesses. Be honest with yourself about your capabilities. Whether you’re a business owner or a social media professional, if you don’t have the know-how to pull off a particular social media marketing campaign, you stand to waste a lot of time and/or money. Business owners, it very well may be worth it for you to hire a professional that has the experience. Social media professionals, you’ll earn a lot more respect if you reach out to your network and either refer the business to someone who has the know-how or asks for help. If real estate’s motto is “location, location, location”, social media marketing’s motto should be “target, target, target.” Use the analytics available to get to know your fan base. Even with your public posts, put up information they’ll care about. And when you’re running promoted posts, narrow the audience well. It’d be better for one person who is almost 100% guaranteed to buy your product see your promoted post than have a larger audience who couldn’t care less. Jen specializes in providing innovative strategies and developing support services to manage marketing efforts with ease. Ingrid’s passion is to help clients harness the power of social media for their business. From presenting innovative ideas to devising a winning strategy to staying in-the-know of the latest, she helps clients utilize this technology in surpassing their business goals and keep them ahead of the competition. She has worked with clients ranging from small businesses to global enterprises, and from a colorful array of industries including fashion, technology, and entertainment. Ingrid regularly executes and presents social media audits, gives group training sessions, consults one-on-one, as well as helps monitor, drive and report on activity for different brands’ social channels. Answer: Always filter content through the 3 C’s (clear, concise and captivating), and always keep a focus on providing value to your audience.